This is one INCREDIBLE breakfast! All the prep work is done the night before and ready to pop in the oven in the morning! The caramel apple flavor is in each and every bite and the syrup is phenomenal! 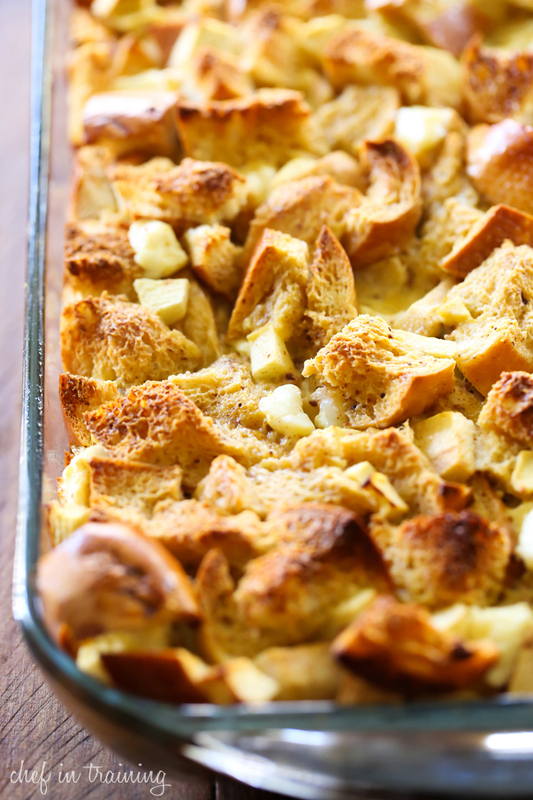 Overnight french toast casseroles are such a fabulous breakfast for busy mornings. All the prep work is done the night before so that all that is required of you come morning is to just pop it in the oven! How simple is that?! Caramel Apple is my favorite fall flavor combo. As you can tell by my most recent fall recipes, this combo is a common occurrence at my house :) Which is why it a version needed to be added to my current list of overnight casseroles on this blog. This recipe is bursting with apples and pockets of cream cheese. The syrup is down right amazing and is a complete must to get the full flavor effect that this recipe offers. Do not skip out on it! If you are looking for a ridiculously yummy breakfast that requires minimal work, give this one a shot! You will be so glad you did! Place half of the cubed French bread in the bottom of the baking dish and set the other half aside. In a large mixing bowl beat the eggs with a whisk until well blended. Add heavy cream, milk, caramel sauce, vanilla, cinnamon and nutmeg and whisk until well blended. Set aside. Sprinkle 1 cup apples over the bread cubes. Divide the cream cheese into quarter inch cubes and place over the top of the apples. Pour half of the egg mixture over the top. 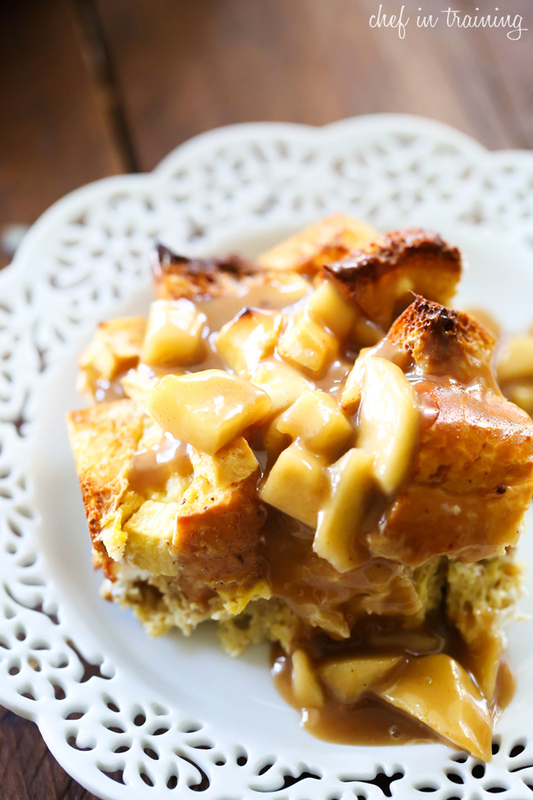 Place the remainder of the bread cubes over the top of the casserole and sprinkle the remainder of the apples over the bread. Pour the remaining egg mixture over the top and press the bread cubes into the egg mixture. In a medium sauce pan, melt the butter and then add the apples and sauté until tender. Add brown sugar, cream and cinnamon. Bring to a boil and cook for 1 minute and remove from heat. Pour syrup into a container and pour over French toast. Store remaining syrup in an airtight container in fridge and reheat as needed. I wouldn't be able to resist such thing for breakfast.. Yummy! Love this recipe and can't wait to try it for a morning meeting I have with my club. However I am not clear on how it is an overnight casserole? The directions don't explain if it can be prepared totally the night before, or if the ingredients can just be assembled the eggs and milk added just before baking. It seems the eggs and milk would make it soggy overnight. Can you clarify? I have made french toast casseroles before. Doing it overnight makes the bread softer but it has never made it soggy for me. When it cooks the eggs firm it up. Sounds so delicious. Thank you. It says this is an overnight french toast casserole. At which step do you refrigerate it overnight? Is it after you pour the egg/milk mixture over the bread cubes to let it soften them? Thanks! Making this recipe this weekend and wanted to make sure! Do I need to worry about the apples turning brown while it chills? Thanks! Making this for tomorrow! is it suppose to still be eggy after it cooks or how does the consistency suppose to be ?